The whole problem can be stated quite simply by asking, Is there a meaning to music? My answer would be, Yes. And Can you state in so many words what the meaning is? My answer to that would be, No. You compose because you want to somehow summarize in some permanent form your most basic feelings about being alive, to set down... some sort of permanent statement about the way it feels to live now, today. When I speak of the gifted listener, I am thinking of the nonmusician primarily, of the listener who intends to retain his amateur status. It is the thought of just such a listener that excites the composer in me. New Updates! (4/26/2019) We've been working really hard on completing our membership system so you can submit quotes and keep track of them. Once this is complete in the coming weeks there will be a lot more quotes by Aaron Copland and other authors. 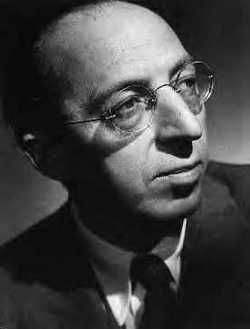 We've also changed the sorting on the site so you now see the latest Aaron Copland quotes first. Our goal is to have the best Aaron Copland quotes on the web!